Persistence has finally paid off. For years I’ve been sifting through scans of old documents in an effort to extend the family tree further back in time on the Kakoschke line. After pouring over dozens of barely legible scans of births, deaths and marriages in Groß-Blumberg and Pommerzig from the latter half of the 19th century, I recently came to the conclusion that a death registered in 1876 might well hold a relevant clue. Vor dem unterzeichneten Standesbeamten erschien heute, der Persönlichkeit nach bekannt, der Bauer August Kakoschke, wohnhaft zu Groß-Blumberg und zeigte an, dass Gottfried Kakoschke, Bauer, sein Vater 59 Jahre alt, evangelischer Religion, wohnhaft zu Groß-Blumberg, verheiratet gewesen mit der lebenden Anna Dorothea, geborene Redlich, Sohn des Bauern George Kakoschke und dessen Ehefrau Christine, geborene Noske, in Groß-Blumberg am sechsten März des Jahres tausend acht hundert sechs und siebzig, vormittags um drei Uhr verstorben sei. Vorgelesen, genehmigt und unterschrieben gezeichnet August Kakoschke. 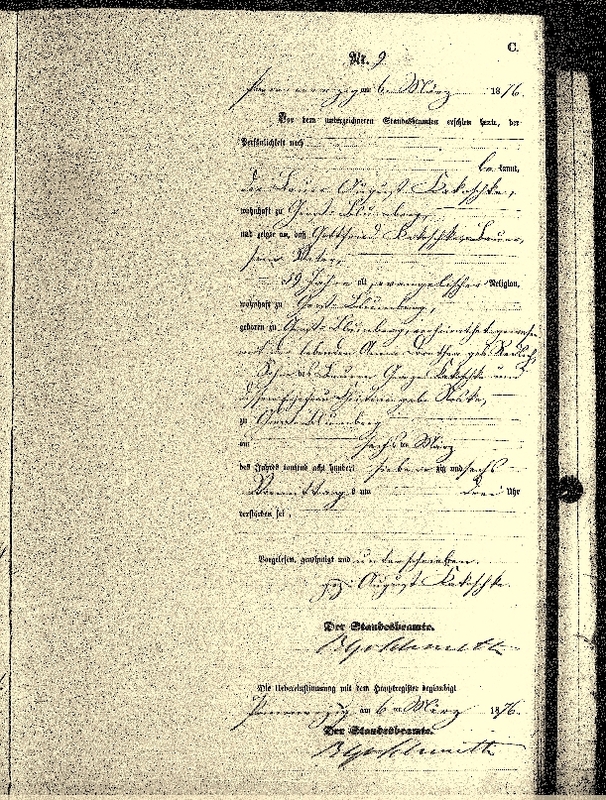 Before the undersigned registrar came today the person known as farmer August Kakoschke, residing at Groß-Blumberg and indicated that Gottfried Kakoschke, farmer, his father, was 59 years old, of Protestant religion, residing at Groß-Blumberg and married to the living Anna Dorothea, née Redlich, a son of farmer George Kakoschke and his wife Christine, née Noske, in Groß-Blumberg on the sixth of March of the year one thousand eight hundred and seventy six, had died at three o’clock in the morning. Read over, approved and signed by August Kakoschke. Success at last! 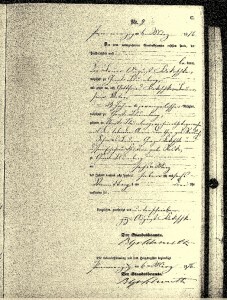 It is indeed the death registration of Gottfried, registered by his son August. This registration also revealed that August Kakoschke was a previously unknown brother of JFWK, aka Jack Kakoschke. But, that’s not all. From other old document scans I believe I’ve also identified the parents, and grandparents, of Jack Kakoschke’s mother, Johanne Dorothea, née Redlich (click to view details). It’s quite fortuitous that these 19th century German death records contain not only the name of the next of kin, but also the names of the deceased’s parents. I wish the Australian and British records did too.